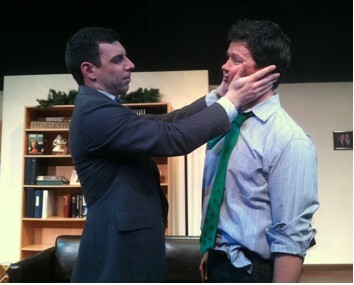 Last weekend I had the pleasure of seeing Argos Productions’ Murph at the Boston Playwrights Theater. This is the second Argos show I’ve seen, and after their really fun production of Wandaleria, I was excited to see more of Brett Marks’ work. I like to be surprised, so I had no idea what the play was about before going to the theater. I’ll confess, I’ve never watched Mad Men or The West Wing – but I absolutely get the love of political/office drama. I thought the script was clever and engaging, the actors told their story effectively, and there was in interesting message going on. The set looked great; it was a simple and classy politician’s office at Christmas time. The book shelves were lined with a mix of economics and inspirational Boston sports books. Everything was just so, and that not-quite-real feeling you get from a set – any set – was actually perfect for a politician. The play was off and running quickly, throwing the audience right into the inner circle of Massachusetts State Representative Kevin Murphy. Right from the beginning I was working to keep up. The Boston accents were strong and not entirely consistent across the board, and the name dropping was plentiful. I could catch up based on context, but many of the jokes and references went right over my head. This isn’t necessarily a bad thing; the play just knows its audience – that just happens to not be me. Don’t get me wrong, I enjoyed the story quite a bit, but the world of the play might have made more sense if I had understood politics in Boston in the 90’s. I would blame it on my west coast education, but my east coast-raised companions were not much better off. It’s because we’re twenty-somethings and were not politically aware at the age range of 2-5. We’re not going to have a personal connection with the time period on stage, so we’re going to look to the characters to bring us into the world. At this, the show excelled. I was wrapped up in the drama completely. When Kevin Murphy reveled parts of himself to his staff; or Seth the Washington big-shot invaded and dissected their lives, I cared. Confession, discoveries, manipulation and intrigue kept the realistic character drama moving. Catherine O’Neill’s script was deeply clever and well paced. I rarely felt a scene was dragging – though much of that can be attributed to Brett Marks’ skillful directing. I was unsure of Robert Pitella’s Murph at first, but I was sold after Act I. It took awhile for the character to unfold as a real person, instead of a cardboard-cutout politician. Once he did, I was really intrigued; but it’s always hard for me when it takes half a play to see a character, especially in a four person show. James Bocock and Emily Kaye Lazzaro stood out as Gary and Katie. They had fantastic chemistry and put the action into their bodies the most effectively. James Bocock’s Boston accent sounded the most consistent and easy – maintaining their accent seemed to strain others at times- and the scenes that highlighted them really shined. I’m really excited to see where Argos Productions goes. As a new company they’ve really impressed me with great talent, strong directing (and I’m picky), and smart texts. I know I will definitely go see whatever they do next.